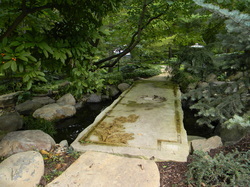 Rockford Landscape installed the first phase of landscaping at the conservatory during 2009 to 2011. We were also asked to assist with the installation of some of the larger interior trees, soil as well as interior hardscape items. We were hired by the Rockford Park District to replace aging timbers found bordering the "Island Green" of hole #8. This project had to be done very late in the year so our work would cause the least amount of disruption to golfers. We removed the timbers and replaced them with granite boulders supported by concrete. Rockford Landscape Engineering was selected to install landscaping for the 2010 expansion of the Burpee museum campus in downtown Rockford. 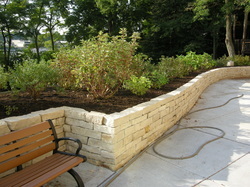 This project included hardscape items like retaining walls and a paver design set into the concrete. Landscaping involved trees, shrubs and some prairie plantings. 16 foot long stone bridge.